April 13, 2017 1 comment on "Chicken Fajita Seasoning Mix"
Homemade mixes are fun and easy to make. I love looking at all my little jars of mixes lined up on my shelf. 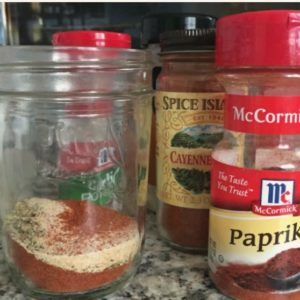 Recently I tried out a recipe for chicken fajita seasoning mix, and it is really good too. It turned out to be a great recipe, so I decided to add it to my shelf full of mixes. Place all of the above ingredients in a airtight jar or ziploc bag. To use this seasoning, you just sprinkle it on your chicken while you are grilling or frying it. You can use it for making chicken fajitas, or just use it as a seasoning for your chicken. This seasoning really has a lot of flavor, I really liked it. Now when I want to make chicken enchiladas, I will have my secret ingredient. Try this seasoning mix when making these crock pot chicken fajitas. 1 Comment on "Chicken Fajita Seasoning Mix"
Previous Previous post: Why Doesn’t My Hydrangea Bloom?